Greater Brussels is made up of 19 communes. These are local authorities, in effect towns, and are responsible for among other things the parks and the streets, local schools and sports centres. They also co-operate with one another (sometimes) to administer or oversee other services such as water and power supplies and (I think) the collection of rubbish. The communes are fiercely protective of their autonomy (a bit like Britain in the EU now I think about it). One of these communes, Molenbeek, recently attracted international opprobrium as a nursery of terrorism. Terrorists associated with both the major attacks in Paris last year had family connections in Molenbeek. You can still find articles on-line in the international press with titles like: “Molenbeek: Inside Belgium’s seething city of jihad where ISIS are heroes” (the British Express) or “Molenbeek: A Troubled Neighborhood in a Failing State” (the US National Review). When all the world’s press started writing about how terrible and dangerous Molenbeek was (and by extension Brussels), friends and relatives started getting in touch to check that Mrs SC and I were “safe”. It was all a little confusing. While I wouldn’t claim to know Molenbeek, I’ve been there, I’ve shopped there and I’ve walked through parts of it with a camera. It never struck me as exceptional in the context of Brussels, or particularly alarming. We own a standard lamp bought in a furniture store in Molenbeek; we have a favourite art work there we sometimes like to show visitors. This photo, taken from the Porte de Flandre bridge, I actually took last February. 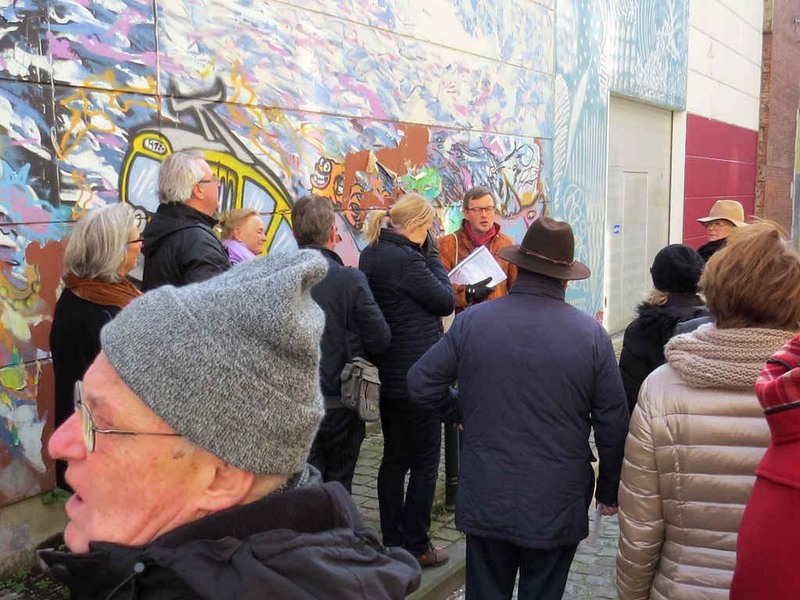 Our walking tour started on the bridge and the Charleroi Canal, which separates Molenbeek from the Ville de Bruxelles, is a key to the history of the place. On Saturday’s walk I learned that the Charleroi Canal was one of the earliest navigation canals in Europe, though it’s gone through many enlargements and extensions over the years. It now links the port of Antwerp to the north with Walonia to the south. And, further beyond, with the extensive canal system of France. 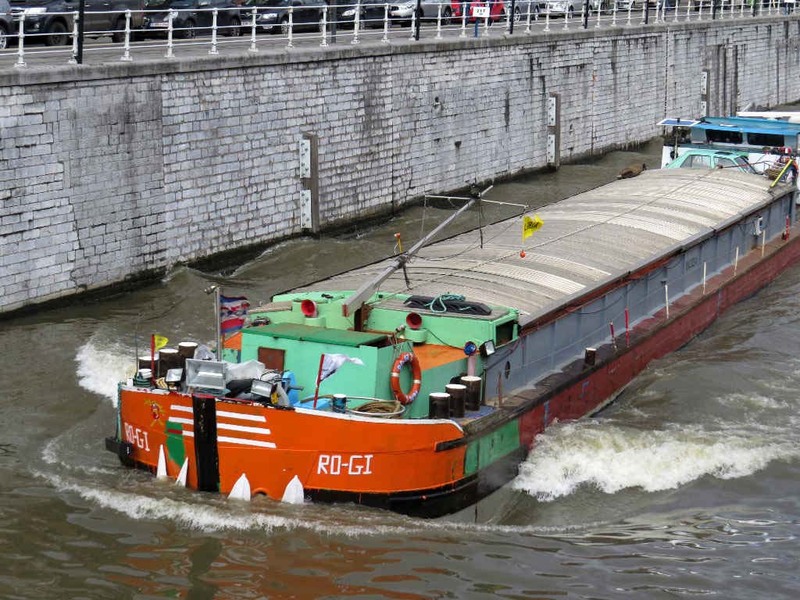 The canal is the reason Molenbeek developed as an industrial centre in the 19th century. Along the Molenbeek side of the canal is an area of once busy industrial buildings. This building on rue du Cheval Noir used to be a brewery. 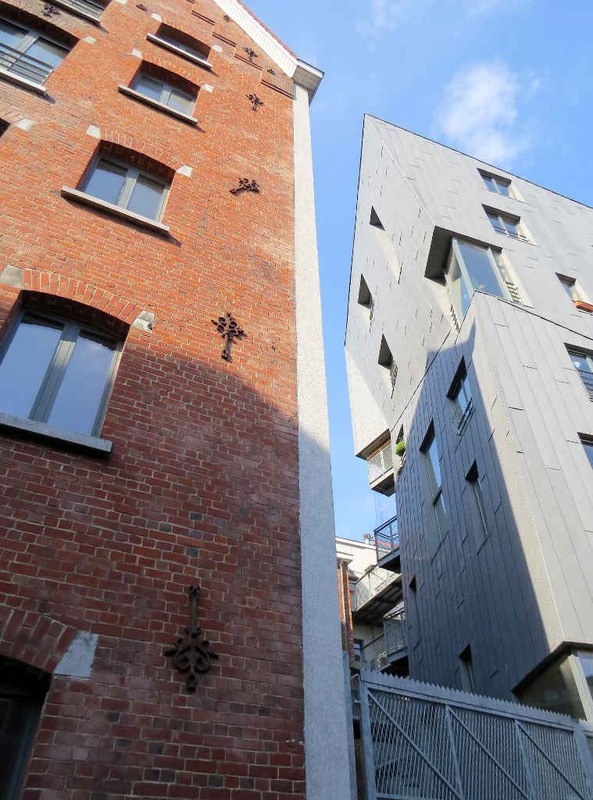 With the collapse of industrialism in Brussels – as in so many places in western Europe – the local authorities have put a deal of effort into “repurposing” the buildings. This one, as you can see, has been extended with a modern construction alongside the original structure to create purpose-built artists’ studios and music practice rooms. 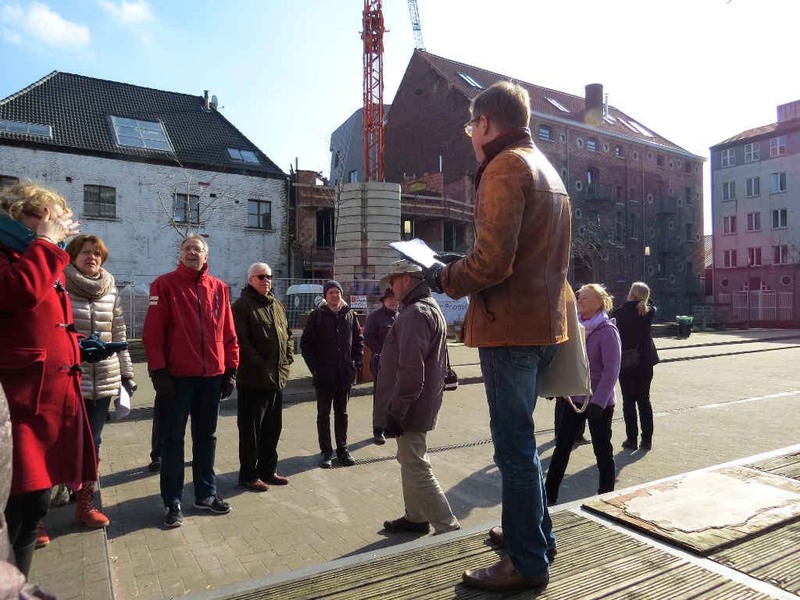 On rue du Cheval Noir, here’s our motley group of Swedish speakers led by Tomas Grönberg, our erudite guide. Note the colourful wall of graffiti behind. There were several examples of graffiti on the walk. I liked them but several of my companions seemed divided over their artistic worth. Here we are in the square behind the artists’ studios/brewery. The brewery is the old brick building in the far corner. See how the architects have echoed the round windows of the brewery in the architectural features of the newer buildings around the square. The same scene from the opposite side (with the bright sun behind me now). And the roundels in the building on rue des Marinier are mirrored in the round shapes of all the satelite dishes on the balconies of the block of flats on rue Fernand Brunfaut. According to information on the Molenbeek commune website about half the 90,000 residents of Molenbeek are Moslems. The majority of those come from Morocco. Several of the residents in the block of flats took an interest in our visit, standing on their balconies to look down at us. It was damn cold in the wind, despite the sun, so no one hung around long. 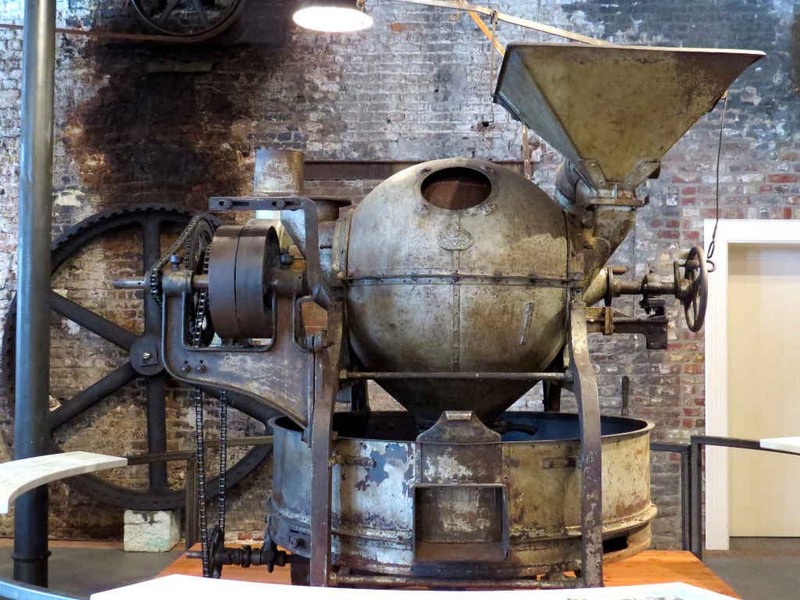 Still indoors, this machine was used to roast cocoa beans, the first stage in the process of extracting cocoa butter for chocolate making. 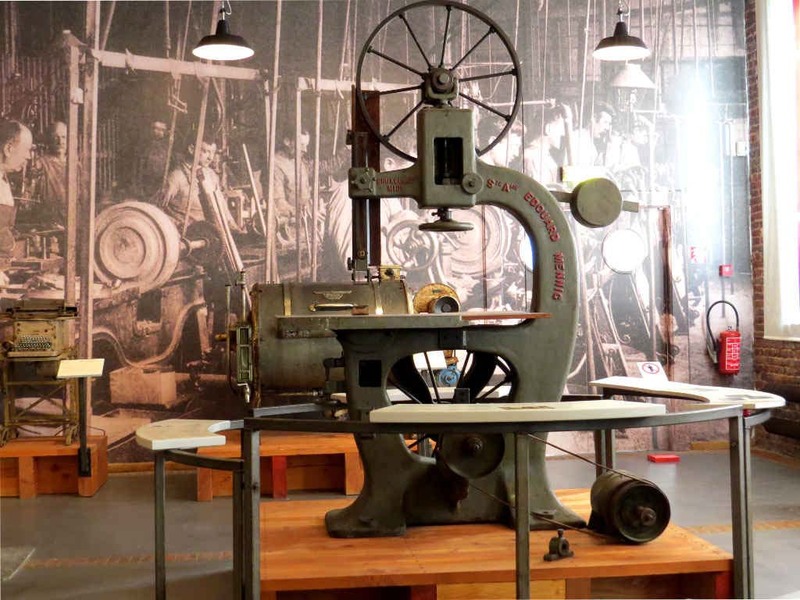 Our guide – we had a special one for the museum – was keen to impress on us how all the industrial processes of the city supported one another, were integrated with one another and ultimately shaped the society that both worked in Molenbeek and bought the goods produced here. 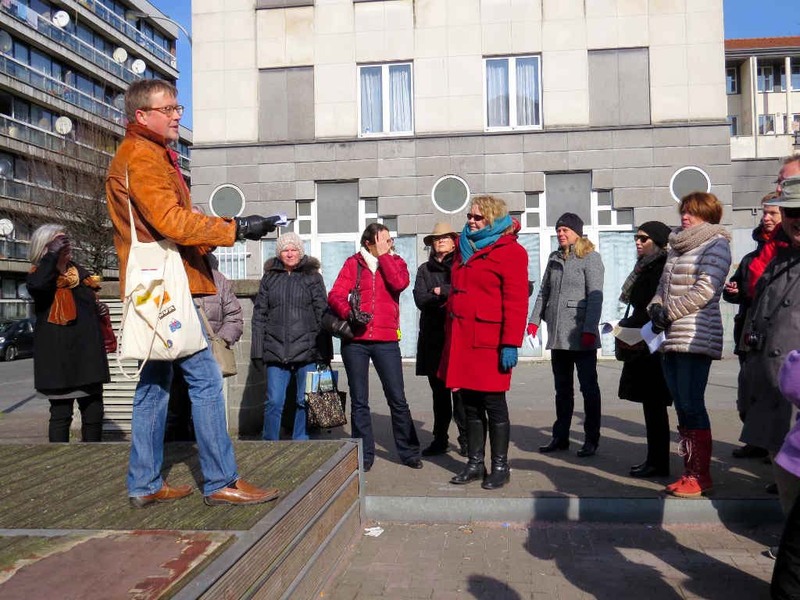 But then it was out into the cold wind again to walk to Place Molenbeek – the Molenbeek market square next to the town hall. This photo was taken just as Tomas G informed us (in Swedish of course) that we were standing in front of one of the shops said to be a hotbed of jihadists. It looked very sleepy, though I did not tempt fate by trying to take a photo. A little way beyond Place Molenbeek is this remarkable tower. 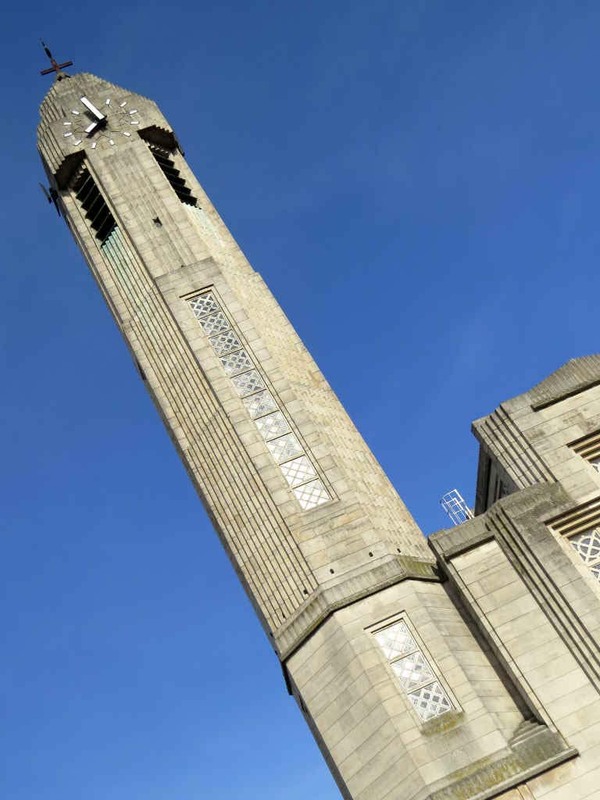 Though it looks like a minaret it is the bell tower of the Parvis Saint-Jean-Batiste – the Parish Church of St John the Baptist. (Officially, this commune is Molenbeek-Saint-Jean). The church was built here in the 1930s, long before the first Moroccans were recruited to work in Belgium in the 1950s. It’s just a happy accident it looks the way it does. In the square in front of the church, a group of young men were enthusaistically playing cricket. Not exactly a sport otherwise associated either with Belgium or the Arab world. I hazard a guess they or their families originated in Pakistan, Bangladesh or perhaps Afghanistan. 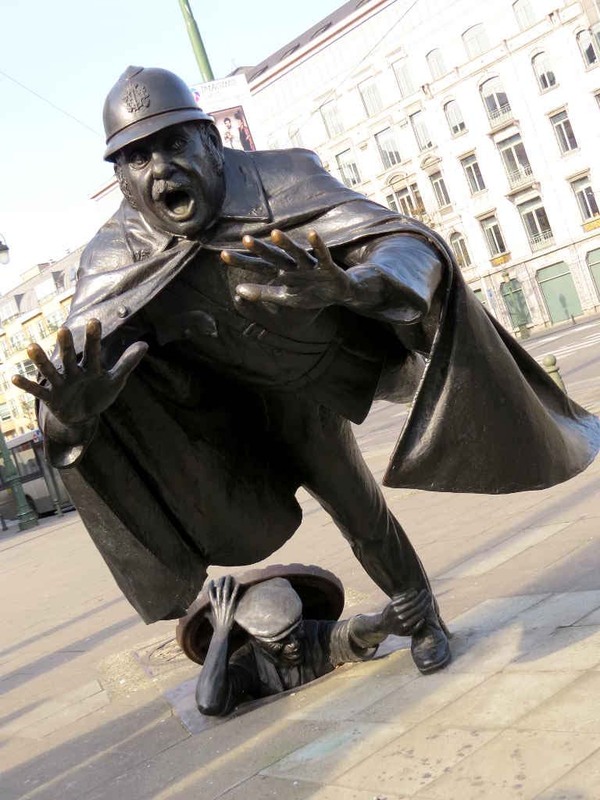 Our tour of Molenbeek proper came to an end at Place Sainctelette where everyone crowded around trying to get a photo of this bronze. 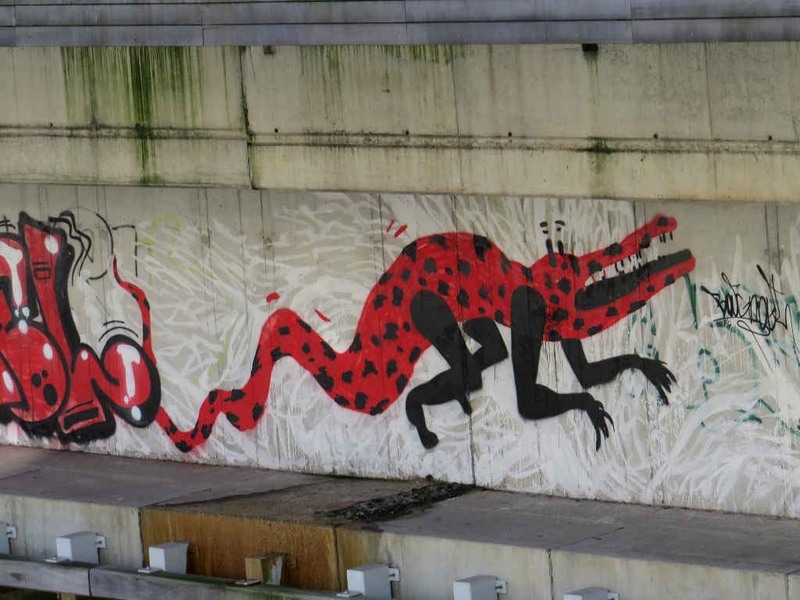 (Nothing to do with Leo II and not produced in the Molenbeek Foundary.) 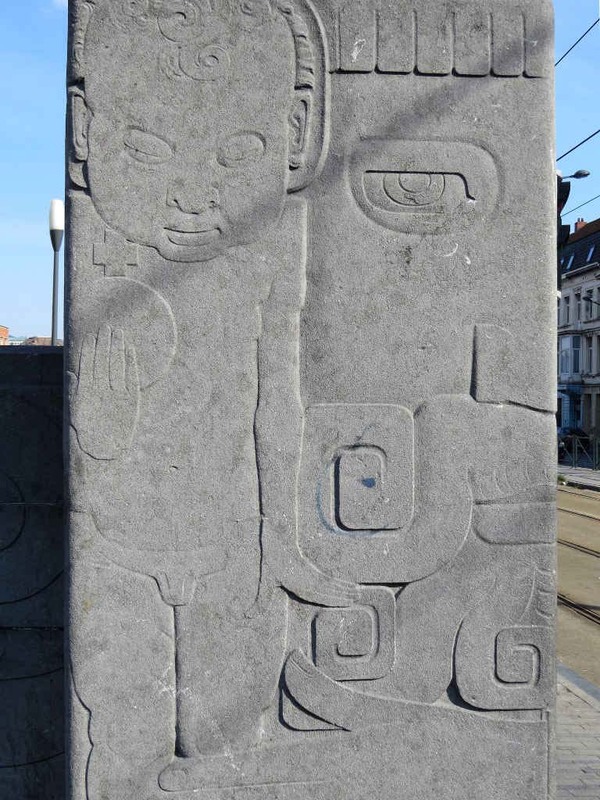 The figure (by the Belgian sculptor Tom Franzen) shows “De Vaartkapoen”. That’s him coming up out of the manhole. Apparently the vaartkapoen are people born in Molenbeek. “De vaart” means “the canal” and “kapoen” means something like “cheeky”. The cheeky young rebel is upsetting authority. The sculpture went up in 1985 and it portrays something that is much older still. (The policeman’s uniform is reminiscent of something from the 19th or early 20th centuries.) I’m not sure what it has to say about the current culture of Molenbeek. I suspect if a modern vaartkapoen were to try this on nowadays the terrorist rapid response force would arrive in short order and arrest him. I’m trying to decide how I feel about that. 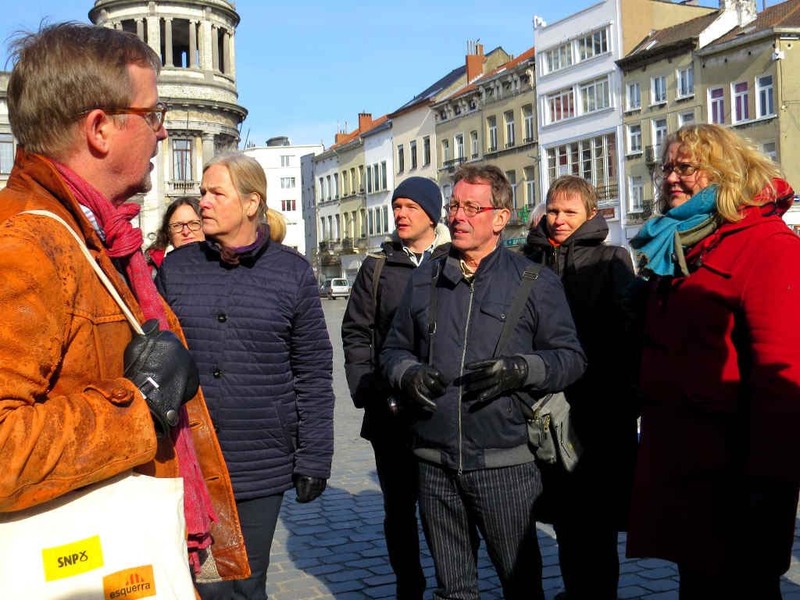 My thanks to Tomas Grönberg and the other members of the Brussels Swedish Club for a fine day out. I originally published this article on the separate Stops and Stories website where it was the most popular post for several months. I revised it for spelling and punctuation, carried out some SEO fine-tuning, and added a new featured image before transferring it here on 2 April 2017.